THERE was a time when the drive from Gwadar to Quetta could take up to five days, across gruelling jeep tracks. But now you can do it in two if you want to take it easy, or even one if you’re in a rush, on a highway so smooth you can sip tea while driving. How this happened is a story that weaves together the disparate strands that make up Pakistan’s troubled political landscape, as well as the forbidding geography of the terrain through which the road travels. 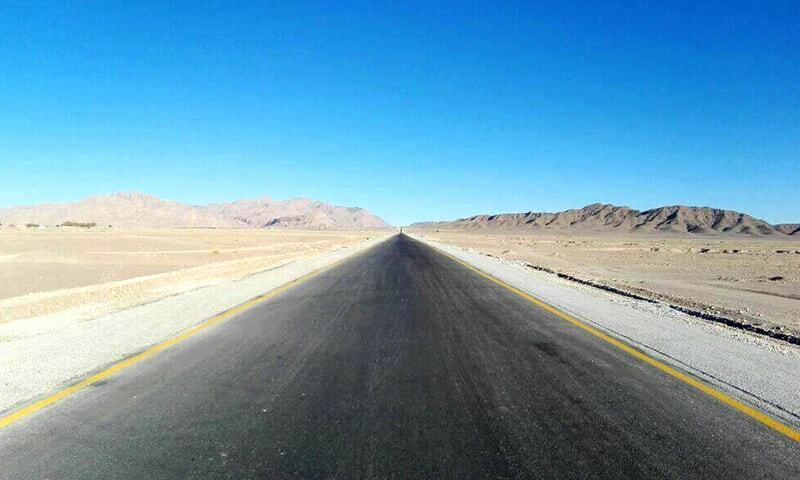 The N85 cuts through the vast expanse of Balochistan south of Quetta. Following the ceremonial departure of two vessels carrying Chinese cargo from the Gwadar port on Sunday, I hitched a ride with some officers from the Frontier Works Organisation (FWO) who were returning to Quetta by the road they had spent the last two and a half years building. It turned out to be a most memorable journey along 750kms of newly built highway-grade road that cuts through barren deserts and rocky mountains in majestic swoops all the way to Sorab, where it links up with the Karachi-Quetta road. The route takes you across three highways. The M8 motorway from Gwadar to a small town called Hoshab, largely invisible from the road, near Turbat. From there it links up in an elegant Y-shaped turn with the N85, an almost 700km-long highway-grade road that takes you to the N25, which carries you through Kalat and Mastung before arriving at the mouth of the Lakpass tunnel at the entrance of Quetta. Some commercial traffic has already begun to ply to road, mostly of local origin. Only a few years ago the journey was nearly impossible to make. When I covered the NFC award ceremony in Gwadar in December 2009, I asked my bureau chief in Quetta about the possibility of travelling there straight from Gwadar. This time was different; the road was impeccable. And although security remains a concern, matters are vastly improved since at least a year. Security becomes more of a concern when driving through the hills or craggy terrain. The construction of these roads actually began in 2007, but was abandoned in a year or so due to security fears coupled with a fiscal emergency that befell the government in 2008. From 2010 onwards an insurgency raged in the area, and two of the towns past which the road travels — Turbat and Panjgur — became epicentres of discontentment. In 2014, as the fiscal situation stabilised, the FWO was redeployed in the area. “The first year was difficult,” says one of the officers I’m driving with. “IED [improvised explosive device]attacks were common, rocket fire was regular. It was quite difficult working here initially.” Almost 40 people were killed in that first year, half army and half civilian, and another 350 were injured, some seriously. Much of the drive is flat, but portions cut through spectacular rocky hills. But much of that has subsided. The last IED attack, according to several officers, was in January. Today the occasional rocket will land on a camp at night, and sometimes convoys take short bursts of light arms fire from the roadside, but nothing more. Attacks come especially in areas where the road travels through craggy terrain or hills that provide hiding places, or dry water channels that provide escape routes. Since the FWO consists largely of engineers, it is difficult for them to give chase to militants who flee into surrounding hills quickly after initiating an attack. “What is the difference between the way Baloch militants fight versus the TTP,” I asked one of the officers who saw action in Fata. Traffic is thin on the desolate highway. 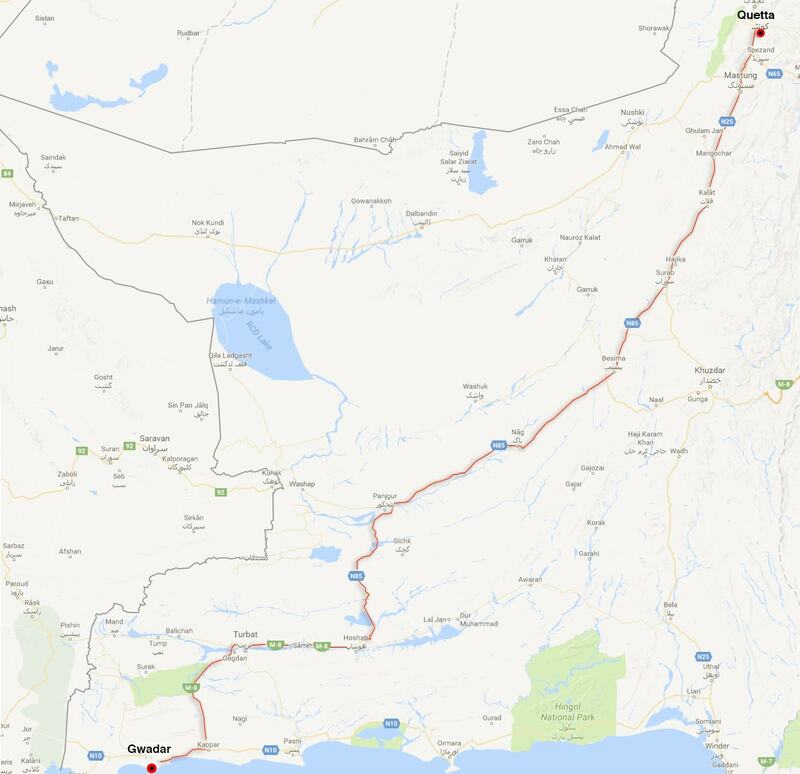 A map showing the route taken through Balochistan. The engineers working on the road see it as a hearts and minds project. “With the road, there comes a small cottage industry, and with travel comes exposure,” one of them tells me. A few signs of this can be seen after long intervals, with small tea shops springing up on some stretches of the road; but the region is so desolate that one can travel for almost a hundred kilometres in some places without seeing any sign of life. How much will the road help the locals? Gauging that will take time, clearly. At the moment, some passenger buses can be seen plying the road, indicating that a limited amount of connectivity is under way. But a thriving roadside industry of the sort one sees along the GT road will only emerge once large-scale commercial traffic gets under way. And that will take many more years.